TORONTO, ONTARIO (May 8, 2017). Skyservice™, Canada’s leader in business aviation, is pleased to announce that after adding the Bombardier* Global* aircraft to our Authorized Service Facility offerings, we have successfully completed our first 120-month and 180-month inspections. The 180-month items were added to avoid costly downtime and interior removal at the 180-month interval. The aircraft was completed on time and on projected budget. The inspection included several avionics upgrades, including ADS-B out to comply with the January 2020 mandate per TSO 260 B. Several recommended and optional service bulletins were also completed during the extended downtime with the extra access gained during the 120-month and 180-month inspection, at a significant cost savings. 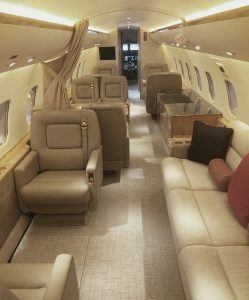 RAMM Aerospace of Montreal, which has operations within Skyservice’s Montreal facility, assisted with the interior removal and installation as well as the interior upgrades that included carpet, cabin sidewalls and bulkhead coverings. The cabin seats were reconditioned as well to further support the owner’s request to brighten up and update the interior. RAMM and Skyservice™ worked with the principal and the design team to revitalize and refresh the interior. 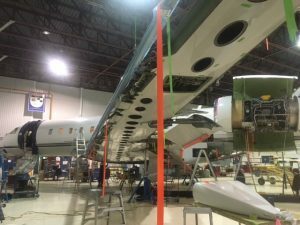 With the close collaboration of Safran landing systems MRO in Oshawa and Bombardier*, the landing gear overhaul was completed ahead of schedule and on budget. This includes new bushings and bearings, as well as all service bulletin upgrades as part of the overhaul process, complete with a five year warranty. 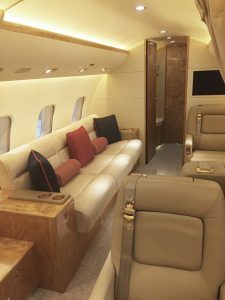 Bombardier Global 5000 * jets are a staple of the worldwide business jet fleet with over 110 in service, having completed over 130,790 landings. By combining expert engineering and superior craftsmanship, every detail on the Bombardier Global 5000 * aircraft has been meticulously designed to deliver an exceptional private jet experience. With a cabin that is nearly a foot wider (30 cm) than its nearest competitor, coupled with an advanced wing design that optimizes speed, range and control, the Global 5000* aircraft delivers maximum comfort and a remarkably smooth and comfortable ride. Director, Business Aircraft, Business Development & Sales. Skyservice™ is a dynamic Canadian aviation organization that is dedicated to the core principles of safety and service. With over 30 years of experience, Skyservice™ is the leader in the Canadian business aviation market. With a diverse team of aviation experts and a commitment to exceptional service and outstanding levels of safety, Skyservice™ has earned its world-class reputation for excellence in aviation. At each of our four FBO locations in Toronto, Calgary, Montreal and Ottawa, we are dedicated to a full range of business aviation services, leading the industry in each of the following core business competencies: Aircraft Maintenance, Aircraft Management, Charter, FBO, Aircraft Sales and HondaJet Sales. Visit www.skyservice.com today to learn more about Skyservice™.